Northwest Healthcare Center is a for-profit nursing home owned by Cincinnati-based CommuniCare. This nursing home maintains 91 certified beds for both short-stay and long-stay residents. Northwest is one of three CommuniCare facilities located within a mile of each other in Baltimore. This nursing home is what it is. It has a two-star overall rating. Before we dig further into the nuances of this unimpressive nursing home, let's look at the nearby competition. There are lots of nursing homes in the area, mostly bad to average facilities. This is a tough area of Baltimore to find a quality nursing home. Within two miles of Northwest Healthcare Center in Baltimore are ten other nursing homes. One of these, Lochearn Nursing Home, got an overall 5-star rating from Medicare: the top score. Three facilities got 1 star: the bottom rating. Two got below-average 2-star ratings - as did Northwest Healthcare. Three got three stars (average), and one got four stars (above average). 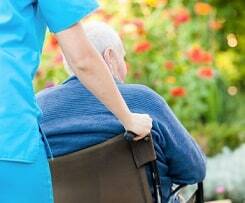 In short, there is a great deal of spread, in terms of quality, among nursing facilities that are very close together. Northwest Healthcare Center is one of three CommuniCare facilities located less than half a mile apart in Baltimore. Though receiving only a below-average 2-star rating from Medicare, Northwest beat her two sister facilities, both of which received the 1-star lowest rating. It is a fitting neighborhood, in a way, for Northwest Healthcare. With its 2-star rating, Northwest appears to be on the lower end of that spectrum. However, a detailed look at the report from the latest standard Medicare inspection (October 2015) suggests that Northwest is, perhaps foremost, inconsistent. It has both high and low scores from Medicare. In 2012, an employee of Northwest Nursing and Rehabilitation Center pushed and slapped a 71-year-old resident of the nursing home. The victim was not badly hurt, but the employee was convicted of assault. Should we blame Northwest Nursing for this? Certainly, it happened several years ago and you cannot know whether this was a bad hiring decision or just a bad employee that had not yet revealed her true colors. But you would be more inclined to give this nursing home the benefit of the doubt if it did not still have so many problems to this day. It is easy to be impressed with CommuniCare's ability to turn a profit. The company must be making money hand over fist to be growing as quickly as it has. In terms of the quality of their facilities, we are far less impressed. These Baltimore facilities they have are Exhibit A. Blue Point Healthcare Center: In the Medicare rankings, Blue Point matches Northwest only on quality measures (both were rated above average). Otherwise, Blue Point was rated only equal to or below Northwest. BridgePark Healthcare Center: This CommuniCare facility scored slightly higher than sibling Blue Point, and it even beat Northwest Healthcare (3 stars to 2 stars) on staffing; but its overall 1-star rating - the most important rating -- is just abysmal. Lochearn Nursing Home, LLC: Lochearn is the big player in this part of Baltimore, with an overall 5-star rating, as well as five stars for quality measures. This facility beat Northwest in all four main Medicare categories. Levindale Hebrew Geriatric Center and Hospital: This facility shows poorly against Northwest in terms of Medicare quality measures (2 stars to 4 stars), but its very strong score on staffing (5 stars) probably accounts for why Levindale got an overall 3-star rating, versus the overall 2 stars for Northwest. Brinton Woods Health & Rehabilitation Center at Arlington West: This facility's Medicare scores were nearly identical to those of Northwest (Brinton Woods one point better on staffing), so these two facilities appear to be very comparable. Milford Manor Nursing Home: Milford Manor got a very respectable 4-star Medicare rating for staffing (well ahead of Northwest Healthcare's 2-star rating). Why, then, did Milford Manor get rock-bottom 1-star ratings (below Northwest each time) in the other three main Medicare categories? Autumn Lake Healthcare at Alice Manor: If one were strictly averaging, Northwest and Autumn Lake would be almost identical in terms of their Medicare scores - one a little better on staffing, the other a little better on quality measures. Crawford Retreat: Here is another Baltimore facility that makes a tough competitor not only for Northwest but most nursing homes: its staffing, above average; its quality measures, much above average. Crawford Retreat got an overall Medicare rating of 4 stars, versus the 2-star rating for Northwest. Manorcare Health Services - Roland Park: In three of four main Medicare rating categories, Manorcare beat Northwest by a point: 3 stars to 2 on staffing, 5-to-4 stars on quality measures, and 3-to-2 stars overall. Augsburg Lutheran Home: With Medicare scores that are identical to those of Manorcare, Augsburg poses a similar degree of competition to Northwest. Northwest got two stars for its last health inspection, its total of 17 deficiencies spread among six of eight measured categories; happily, it had no deficiencies for mistreatment. Its total was significantly more than the 11.4 deficiencies on average for Maryland and over twice as high as the U.S. average of 7.1 deficiencies. Northwest was a shade high in its number of fire safety deficiencies (5 here, versus four on average for Maryland, 3.4 nationally). It has had no federal fines or payment denials in the past three years. This facility also got two stars from Medicare for its staffing (that is, nurse staffing). Northwest was on the low side of average in terms of total daily nurse time per resident: 13 minutes below the Maryland average, four minutes below the national average. Northwest got a slightly better three stars for RN staffing in particular, even though it was very much below the state and national averages regarding daily RN time per resident. Total RN time per resident per day here was only 34 minutes, versus the Maryland average of 59 minutes, and the U.S. average of 50 minutes. Northwest was a bit more generous than average (by 12 or 13 minutes a day) in time spent by LPNs and LVNs (licensed practical nurses, licensed vocational nurses). But it was extremely below the state and national averages on time spent by certified nursing assistants: a mere 48 minutes per day - only a third as much as the Maryland and U.S. averages. It also was below average on daily time with physical therapists. For Northwest short-stay residents, the most recent Medicare report said that data were unavailable for four of the categories it measures. If the data were unavailable for all of the categories, we would surmise that the facility did not have any such residents; but Medicare does have data for five categories. (Medicare does not explain these anomalies.) For the five short-stay categories with data, Northwest got mixed scores. In the count of how many short-stay residents experienced moderate to severe pain, Northwest scored a perfect zero percent: none of them did. But short-stay residents here were three times more likely than the state and national averages to have a bedsore) and over twice as likely than average to be taking antipsychotic meds. Northwest was better than average in giving these residents pneumonia shots, and worse than average on dispensing flu shots. If the Medicare quality measures are reasonable metrics for gauging the amount of care residents receive, then the performance at Northwest appears to be rather erratic with respect to long-term residents. Northwest got excellent scores in five of 15 measured categories for long-term residents. At a nearly negligible 0.3 percent, the rate of urinary tract infections here was 14 to 15 times lower than the Maryland and U.S. averages. Why have they done so well on this important safety issue for seniors? It is a complete mystery. Another mere 0.3 percent of these residents reported having serious pain; the state and national averages (6.0 percent and 7.8 percent, respectively), were 20 or more times higher. Only 0.5 percent of these residents were subjected to ongoing catheterization, and none were subjected to physical restraints. Long-stay residents here were significantly less likely than average to suffer a fall with injury. Northwest also had some scores that were below the state and national averages, but not by much. The incidence of pressure ulcers (bed sores) was a few points higher than average, as was the incontinence rate. Our nursing home lawyers always look at the bed sore rates not just because bed sores lead to lawsuits but because poor pressure sore statistics are co-travelers with bad nursing homes. Long-stay residents here were significantly more likely than average to experience a decline in mobility, and somewhat more likely to need help in conducting routine daily activities. A seemingly paradoxical statistical pairing is for the related categories of depression and antipsychotic medications. Some 2.4 percent of Northwest long-stay residents had depressive symptoms - only about half the Maryland and U.S. rates. But Northwest doled out antipsychotic meds to a whopping 43.4 percent of its long-term residents - over three times the Maryland average. When any statistic is this far out of line with the averages, we consider it noteworthy. Why do more than two out of five long-term residents here need antipsychotic drugs? Yet when you think about it, it makes all of the sense in the world. The best way to make nursing care easy is to medicate patients. It is much easier to treat zombie patients than it is to treat alert and in-this-world humans beings that express real problems and concerns. Northwest Healthcare Center has had two relatively recent Medicare complaint inspections. The first of these complaint inspections took place on October 23, 2015, about a week before Northwest's acquisition. In one case, inspectors found a bathroom to be dirty even after staffers supposedly had cleaned it. In another case, staffers had cut off water to the faucet in the room of a resident who (for health reasons) was on a strict "nothing by mouth" diet. Medicare wanted to know why the water had to be shut off even when a staffer was present to keep the resident from drinking it. The next complaint inspection, in May 2016, may have occurred around the time of yet another acquisition (perhaps by CommuniCare, the history is hard to track). Even if that is not the case, the complaints this time concerned two individual residents whose behavior may have been beyond the facility's control. In one case, a resident refused to have blood drawn for the purpose of monitoring the effect of a medication the resident was receiving. Medicare cited Northwest staffers for failing to tell the doctor about this resident's refusal. The other case sounds like one in which the lunatic had taken over the asylum. One day in December, 2015, a resident struck another one on the forehead with a cane. (The attacking resident was on meds for dementia and mood stabilization at the time). The same day, this resident spat in the faces of two other residents (and would do so again, to the same residents, two months later). During the following February, this resident bit another one on the hand, necessitating a tetanus shot for that person. In early March, the resident "was noted to have anxiety with rage and was difficult to redirect." On a psychiatrist's orders, the resident's meds were increased. On March 28 this resident hit another resident on the head, starting an "altercation" in which the attacking resident fell and cut his eyebrow. In response to the March 28 incident, staffers decided that this resident needed "greater detailed psychiatric intervention," but apparently they did not change the resident's care plan. The psychiatric nurse practitioner planned to give this resident "a gardening activity… as a diversion in an attempt to reduce aggression," but no one followed through to make that happen, either. On April 2, the resident ran up and down the hall, knocking things over. Staffers gave the resident a shot of antianxiety meds. On April 14, a resident tried to strike staffers and threw himself on the floor. Staffers gave him some meds. The resident struck the psychiatric nurse practitioner on the back, so staffers took the resident to the emergency room "for an evaluation." On May 15, the resident was screaming, yelling, throwing food, and flinging things off the medicine cart. States Medicare: "It was noted [that] the resident was unprovoked." Staffers responded by deciding to "continue with the care plan." Medicare found that in this case (or series of cases) Northwest "failed to provide adequate management and supervision" to this resident (you can say that again) and it also failed to protect other residents from this person (ditto). In this case, the resident in question was hurting both fellow residents and staffers. If we found this story in the records of a facility that we had acquired, we would take steps to make sure this kind of situation didn't happen again. How long CommuniCare has been on the scene as the owner is unclear. The report from the most recent standard Medicare inspection of Northwest Healthcare makes no mention of CommuniCare, the self-declared owner of this facility. Medicare does indicate that on October 31, 2011, Northwest changed ownership (being acquired by two private individuals) and took on a new managing-operating company on the same day. The CommuniCare website page for Northwest says nothing except "More Details About Northwest Healthcare Center Coming Soon!" Possibly this means that CommuniCare purchased Northwest after October 31, 2011, and it hasn't had time to create a description of its new holding yet. Has someone in your family suffered needlessly at the hands of a CommuniCare or other nursing home that made a terrible error? Call our nursing home attorneys at Miller & Zois today at 800-553-8082. Don't want to make a phone call yet? Get a FREE no obligation case review. Wrongful death nursing home cases: how much are they worth in Maryland and when can families expect? This nursing home struggles to control bedsore so do many others. The result? A lot of lawsuits involving bedsores. Look settlement and verdicts in bedsore cases. Call our Baltimore elder care lawyers right now at 1.800.553.8082 or get a confidential and FREE online case review. If something awful has happened and it is the result of a nursing home making a mistake or failing to meet its responsibilities, you can hold them accountable.